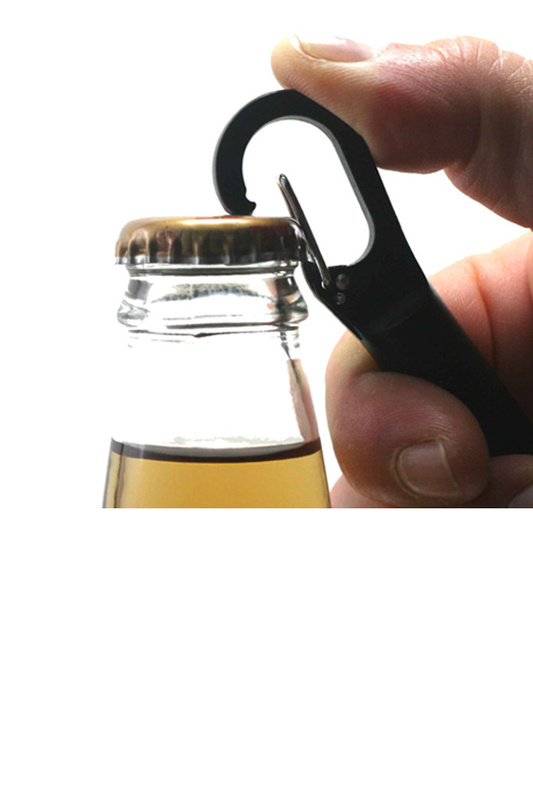 A Carabiner Clip And Storage Container That's Also A Bottle Opener. Durable. Constructed with all metal components, the main portion is all one piece. Step on it, sit on it, or toss it in a bag without worry of damage or your stuff spilling out. Threaded. Flip top openings are prone to failure, and effectiveness decreases over time. The opening on this product features metal threads for added security. It's easy to operate, but you never have to deal with it opening unexpectedly. Dry. It's not 100% water-proof, but it is highly resistant to moisture entry due to an added sealant ring that helps to keep it out. Use in wet conditions, and the stuff enclosed will stay dry. Compact. Similar in size to chap stick, it is small enough to slip into your pocket, or attach to your keys. Add secure storage without increasing bulk. Useful. Discover an endless amount of uses for the container, but also use it to open beer and soda bottles with ease. The clip opening is also an opener. Clingy. The large clip makes it easily attachable. Connect almost anywhere, and ensure that it holds securely. Simple to use, and sure to become invaluable. The tips below will ensure optimal performance and correct usage. To open the tube, unscrew at the end. The opening is opposite the clip, and twists off completely. Turn to the left to loosen and remove, or turn to the right to tighten back in place. Connect almost anywhere with the powerful clip. Simply press with your thumb to push in the metal closure and open the clip. Slip onto loops, cords or rings, and then release to make permanent. Remove in a similar fashion. Use as a bottle opener to pop caps off glass beverage containers. Just align the lower point of the clip under the edge of the lid and then rock forward until the top touches the cap. Lift upward to remove. Don't forget important items, and stop carrying around wallets, bottles and bags that are just not necessary. Give yourself a top secret storage location that you can take everywhere, or use this protective tube to hold valuables and little items you can't live without. 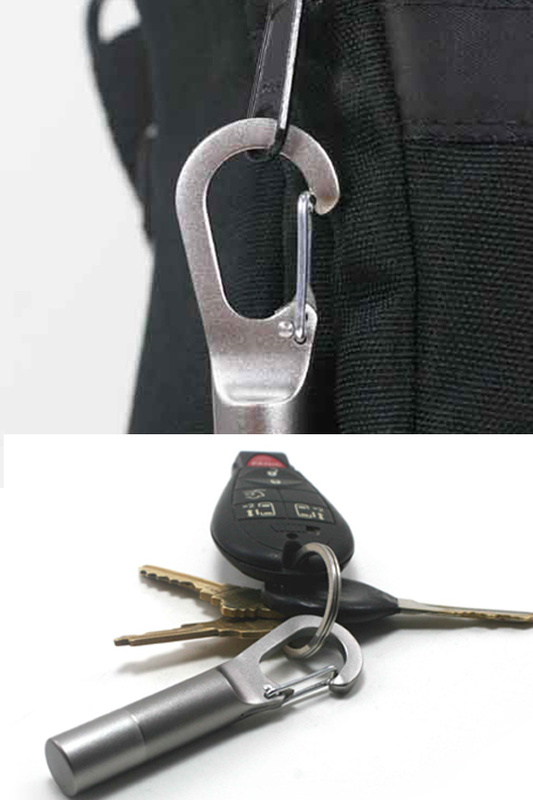 It works great as a key chain, but it can also attach to backpacks, luggage, purses or belt loops to provide a secure place to hold your stuff while keeping it out of sight, and protected from weather and other factors that may cause problems. Anything inside will not get crushed or go missing, so you can leave home totally prepared. Tiny items will be safe and easy to find, and everything can be carried without additional pockets or bags required. Dimensions 1/2" x 1" x 3 1/8"
Storage size 1/2" x 1/2" x 1.75"
Watertight Yes. Added sealant ring helps keep stuff dry. Integrated Bottle Opener Yes. Clip area doubles as an opener. Uses For travel, camping, fishing, hiking or everyday use. Store small items and attach to zippers, loops, rings and more. Top secret storage, or important stuff close at hand. This versatile product is perfect for a multitude of uses, and will allow you to keep valuables ready and protected at all times. Order Yours Today! This travel stash is the perfect place to stash an emergency $20 or medication or other small items that you might need quickly. 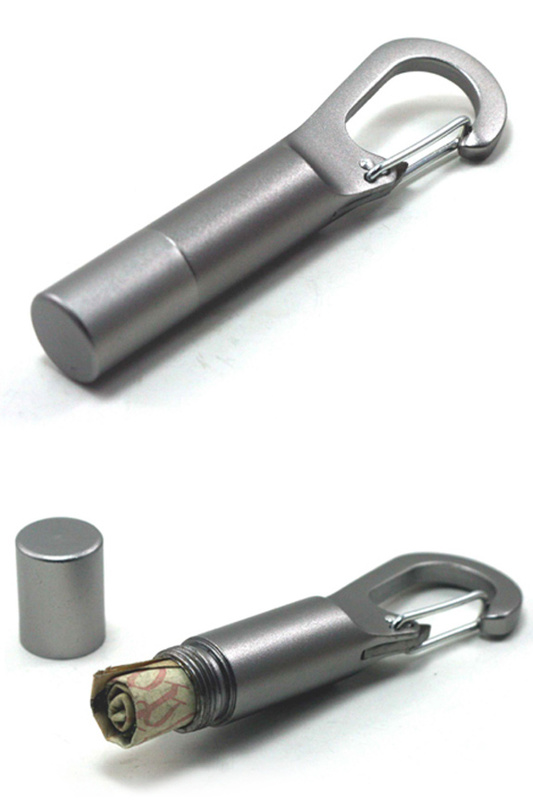 A Ridiculously Useful Keychain Tool. A Keychain Tool To Make Working With Caulk Easier.